The days of waiting to retire to pack into an RV and wheel your way around the country are long gone. Today, technology makes it possible to work and still live on the road as long and often as you wish. If experiencing the life of a nomad sounds like heaven to you, check out these blogs full of insight and information to get you on your way. This is a great blog to teach you how to handle issues that may arise on your own. Learn everything from how to change a tire to choosing the right toilet or keep mold away from your RV mattress. This blog has guides, gear suggestions, videos and more to keep your vintage or modern RV rolling. Josh and Marie are digital nomads who work on the road and will teach you to do the same. 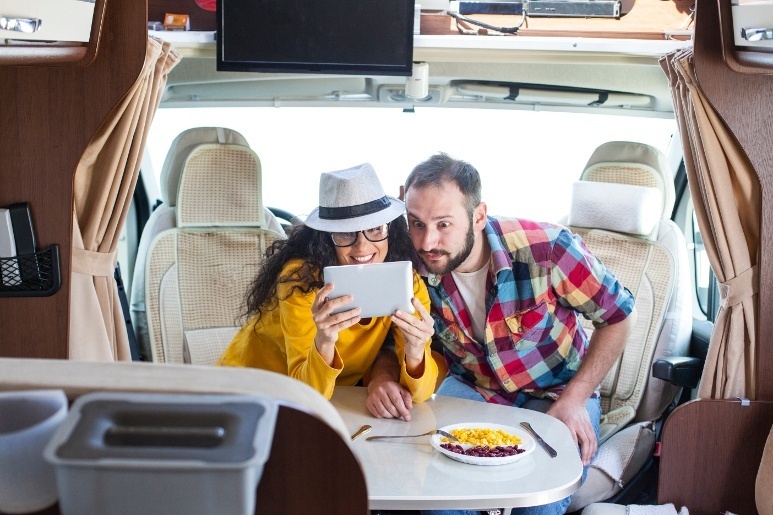 With Wi-Fi now available from just about anywhere and an increased market of telecommuting and computer-based jobs, why be strapped to a desk when you could be strapped into your RV? Bob Wells will show you how to save money whether maintaining your RV or getting it repaired. He also gives advice on choosing a state of residence, budgeting, using solar power and many other interesting and informative topics. Follow full-time fifth wheelers David and Brenda as they wind their way across the landscape. Focusing primarily on Class A coaches, these two blog on all aspects of the nomadic life. Follow the 14 member Kellogg family as they travel the country. Featured on ‘The Today Show’ and a ‘Nick News with Linda Ellerbee’ special, this clan will show you that raising a successful family does not mean you have to be settled in a permanent location. Travelling with pets brings its own set of challenges. Join Paul and Nina as they travel full-time with their two cats and dog. RV travelling and living means long stretches sitting. From eating habits to exercise, Stef and James educate you how to keep your body healthy and in fit shape during your travels. Ray and Anne teach you everything you need to know about living full-time in your RV. Be a part of their experiences and learn the tips and tricks of the trade. Jim and Chris Guild spend their days roaming the country giving seminars on technology. Do you want to learn how to use free software to store pictures or learn all the aspects of Google Maps? These two have an entry or video for all your technology needs. Geared towards so-called ‘beer geeks,’ this blog follows Brian and Maria as they crisscross the country finding all the great beer destinations. Which RV blogs are your favorites?